Fullerton Paint & Flooring sells premium waterproofing and deck coating systems manufactured by Pacific Polymers, Polycoat, and Desert Brand. These highly reputable brands are known for offering reliable, time-tested solutions to protect decks, parking structures, and exterior walkways against water damage. When not property protected, wood, concrete, composite, and metal structures are all susceptible to water damage. Whether the result of a burst pipe or insufficient drainage, these wet conditions can cause untreated wooden decks to swell, contract, and weaken; concrete to crack; and metal fixtures and structures to corrode and loosen at weld points or joints. To prevent such costly damage from occurring, Fullerton Paint & Flooring offers several polyurethane and urethane sealers and coatings to waterproof your surface. Our experienced staff provides technical advice on waterproofing application to ensure that you get the best results possible. Deck coating systems are available with multi-component textures, composite materials, and acrylic cement to keep your deck or walkway dry. Available in multiple colors and designs, deck systems can also be pre-stamped by the manufacturer to resemble stone, tile, or wood, or to achieve a custom look. We offer custom color options to create a deck coating system that complements the look of your home or business. Call or Visit Us Today! We Have Knowledgeable Staff On Site to Answer All Your Questions. 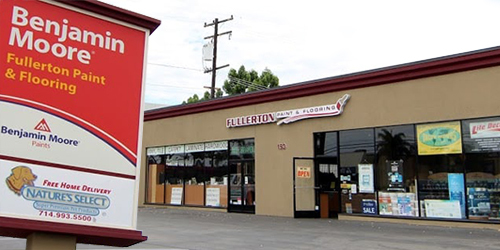 Call or visit Fullerton Paint & Flooring today to find out how you can protect your home or commercial building from moisture, mold, and water-related deterioration. Our trained staff will determine the best waterproofing or deck coating system for your needs and budget. Very selected store, great help, well knowledgeable members of this company, very competitive prices, homeowners and contractors directed, variety of products related to paint, coatings, waterproofing, decorative surfaces, etc., etc. . .